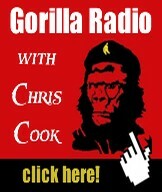 If you read this site regularly, and subscribe to the claims and advice of Rafe Mair, you probably are. Because the 81 year-old Mair is British Columbia's most well-known and well-loved Multi-Issue Extremist (MIE). The now long-established CSIS "Counter Terrorism Strategy" has defined individuals who express dissent toward any number of issues in this way. In particular, people who are committed to opposing unbridled oil and gas development, defined as "activist groups, indigenous groups, environmentalists and others who are publicly critical of government policy." Many people who feel the current rush to massively exploit Canadian resources is the wrong path, also feel the same about farmed salmon, GMO's and private river power expansionism. To name but a few of the Multiple Issues people are concerned with today. In all likelihood, those of you sharing these views are "Multi-Issue Extremists", and you have a working file at CSIS. Many of you have also probably expressed your concerns about these issues on the Internet or attended protest events such as the "Defend our Coast" event last fall, which included a "pledge" of "civil disobedience." Since the upset of the May 14th provincial election, many people endeared to "defending our coast" are ready to double down on their efforts. There have been escalating calls for civil disobedience as a result of the current election, coupled with the realization that the protest options available to British Columbians are now severely limited on a whole array of pressing issues. Recently, the unwarranted surveillance of average citizens has come into the spotlight. Most activists are aware that this practice has been in place since 9/11 and some are aware that they existed well before. Defense Minister Peter McKay confirmed in the House this past week that he approved secret electronic eavesdropping in 2011. The laws ushered in by 9/11 had sunset clauses and were targeted toward "terrorism." However, since the most recent American "terrorist" event, the Boston Bombing, the Harper government has brought back into effect "sunsetted" anti-terrorist legislation. Those of you who pledged a commitment of civil disobedience during the Defend our Coast event did so at a time when these laws were not in place, so you should pay particularly close attention to the CSIS "counter-terrorism" initiative and its focus on MEIs and what it all means now that they have been reintroduced. Because, as of today, most of the millions of Canadian citizens "surveiled" without their knowledge have little if anything to be concerned about, besides the outrageous violation of privacy such practices entail. However, those of us who have committed to the good fight and pledged to massive civil disobedience have much to be concerned about. In fact, as it stands today, you can be arrested right now, and your electronic footprint and pledge to undertake civil disobedience is all that they require. You can be taken from your home, without charge, for up to three days. Your release will be conditional, and if you do not agree to the conditions - such as no longer participating in petro-insurgency - you will not be released and could be detained for up to a year. Yes, you! Right now, you can experience "preemptive arrest" and "preventative detention" under the CSIS counter-terrorism classification of MIE, for what you have already done and what they already have on you. All perfectly legal. But surely this is all hypothetical - powers that exist on paper that our government wouldn't dare implement in reality. Unfortunately, the government's record over the past several years suggests otherwise. According to The Guardian, in 2011, "a Montreal, Quebec man who wrote letters opposing shale gas fracking was charged under Canada's Anti-Terrorism Act. Documents released in January show the RCMP has been monitoring Quebec residents who oppose fracking." In February, we learned through a report from two Canadian academics, based on documents they obtained through Access to Information, that prominent ENGOs like Greenpeace and People for the Ethical Treatment of Animals (PETA) have been classified as "Multi-Issue Extremists". The report observed, "Intelligence agencies have blurred the categories of terrorism, extremism and activism into an aggregate threat matrix." Industry is apparently getting into the act too. According to a Desmog Blog story this past week, "Documents recently obtained by Bold Nebraska show that TransCanada - owner of the hotly-contested Keystone XL (KXL) tar sands pipeline - has colluded with an FBI/DHS Fusion Center in Nebraska, labeling non-violent activists as possible candidates for 'terrorism' charges and other serious criminal charges." Meanwhile, according to this Dominion story, the Canadian government has been orchestrating briefings for energy companies by CSIS, the RCMP and other agencies to share sensitive information involving activist threats to industry. So while we are all fixated on the most recent American whistle blower's "revelations", we should be directing some of that attention to our own government and gaining a better understanding of the terrain we intend to traverse. What Next for Snowden, a Plea Deal? Is the Snowden Case Headed for a Plea Deal? I’m guessing that there is more to Edward Snowden’s choice of Hong Kong instead of Iceland as an intial refuge than a matter of dim sum over skyr, hangikjöt, kleinur,laufabrauð, and bollur. At the very least, Snowden can keep the global media pot boiling with interviews to the avid Hong Kong media about exciting China-related hacking secrets, thereby raising his profile and improving his chances of receiving genuine due process from the courts in Hong Kong and the United States. It’s a better way to keep the world engaged in Snowden’s situation than giving an interview to the Fréttablaðið (Iceland’s biggest newspaper), watching the international stories slip to the inside page, and waiting for somebody to kick the door in. But there’s another card he can play, especially if he doesn’t want to get extradited to the United States, albeit after a spectacular and presumably fair trial in Hong Kong, and then spend the rest of his life in a US prison. That’s for him to make a deal with the US Government not to ignite whatever dynamite he’s got on the four laptops he brought to Hong Kong, in return for brief, easy time in some US penitentiary. After all, in terms of informing and inflaming the public, Snowden’s work is pretty much done. And he’s done it without revealing any operational details. Maybe the best use of the rest of the information he’s got is as a “get out of jail” card. If the USG doesn’t act interested, maybe its attitude will change after a few more embarrassing tidbits make it into the public domain. I’ll be interested to see if the US government tries to get some kind of injunction to get the Hong Kong papers not to report his revelations and remove Snowden’s public relations megaphone–and diminish his bargaining power. In the worst case, Snowden could threaten to turn over his goodies to the PRC if he didn’t get a deal. That would certainly get Washington’s attention; but it would be immediately leaked to the press, branding Snowden with the “traitor” label, destroy any standing he’s been able to accrue, and make him fair game for whatever skullduggery the US decides to send down the pipe. I doubt that’s Snowden’s strategy. But maybe he’s bedeviling the US government with the unnerving prospect that the longer he stays in Hong Kong, the better the chance is that he’ll get snatched by PRC security services; and, if he does get arrested prior to extradition, who knows what will happen to him—and his laptops–during interrogation? It’s a dangerous game with no guaranteed outcome, but what do you expect if you walk out of the United States with a computer full of secrets? I think Edward Snowden (and Glenn Greenwald) knew what to expect, and that’s why he’s in Hong Kong. Critics of Snowden’s leak concerning the extent of NSA surveillance often fall back on the argument that “people who don’t do bad things have nothing to fear”, i.e. extensive/intensive surveillance isn’t an issue for non-wrongdoers. The “Panopticon” issue raised by Snowden (from a Foucault book) states, on the other hand, that omnipresent surveillance is by its nature oppressive—for everyone, including the “good guys”. The gold standard for routine, workaday surveillance used to be the post office. Some of us are old enough to remember the halcyon days when the greatest threat to public safety was the danger that a postal worker would go off and shoot himself and/or his boss and coworkers and/or the public at large. As was reported in the press in the 1990s, a big part of “going postal” was the stressful work conditions (I’m assuming that some of the same practices prevail today, with some modifications, but we’ve got bigger homicidal fish to fry than the post office now and there isn’t as much reporting on the labor conditions inside the USPS). A key problem at the post office was rampant Taylorism (industrial time management). Workers who worked hard and were efficient were not rewarded; they got more work and longer routes. Therefore workers “paced themselves” so they would not conspicuously exceed their quotas. Management’s main job was squeezing more work out of the employees, and a key task was to identify and push the workers who were “pacing themselves”. The whole system was underpinned by the surveillance system. It wasn’t just to detect mail theft. It was to catch workers who weren’t giving what the USPS considered 100%. “These people work hard. The workload …” [a local postmaster] sighs, not finishing the sentence. When asked if he thinks the pressure to perform makes employees feel like they’re being watched for slipups, he covers his face with his hands and scrubs at it, the same way people do when they’ve been staring at a computer monitor too long. “We’re supervising them not to catch them messing up but to be sure everything is handled properly,” he says finally. It’s not hard to see why people lose it working for the post office. The constant surveillance alone would drive some people over the edge, and the peculiar logic takes care of the rest. The fact of being under continual surveillance is, by itself, enough to stress people out. Monitoring noted by the PSI study includes logging emails and internet usage, keystroke loggers, recording and timing calls and measuring shop-till throughput. Bearing the brunt of the IT scrutiny are administrative and white-collar employees, such as call-centre staff and data-entry workers, who complained of an increase in work strain of 10 percent when they are being watched. Phil Richards used to like his job driving a forklift in a produce and meat warehouse. He took pride in steering a case of beef with precision. Now, he says, he has to speed through the warehouse to meet quotas, tracked by bosses each step of the way. Through a headset, a voice tells him what to do and how much time he has to do it. It makes the Unified Grocers warehouse in Santa Fe Springs operate smoothly with fewer employees, but it also makes Richards’ work stressful. Technology has eliminated many onerous work tasks, but it’s now one of the factors contributing to a harsher work environment. Employers are using technology to read emails and monitor keystrokes, measure which employees spend the most time on social networking websites and track their movements inside and outside the office. They can see who works fastest and who talks the most on the phone. They can monitor how much time people spend talking to co-workers — and how much time they spend in the bathroom. The sanitation truck that James Brooker III drives in Raleigh, N.C., has a GPS device that enables his bosses to track his every move. Co-workers have been disciplined for driving too slowly or for taking an extra 10 minutes on a lunch break on a tough day, he said. Employers can read workers’ email, see what websites they visit and read any emails or text messages stored on work-issued computers or smartphones. In all but six states (California is one of the exceptions), employers can require employees to provide their passwords to social networking sites. And in most states, employers can monitor their employees and are not required by law to tell them it’s happening. Michael Cunningham found this out the hard way. His employer suspected he wasn’t working when he said he was and put a GPS device on Cunningham’s personal car without telling him. Officials tracked him driving to a diner instead of work, tracked his son driving to an internship and tracked him during an approved vacation in Massachusetts. A year later, they fired him, explaining the GPS had confirmed their suspicions that he was falsifying his time sheets. With the help of the American Civil Liberties Union, Cunningham sued his employer, the New York state Department of Labor, but lost. Judges in New York’s Appellate Division ruled that the law does not prohibit employers from using GPS to monitor employee behavior if it is relevant to the employee’s job performance. The ruling means that although the government has to get a warrant to use a GPS device to track criminals, it can legally track its employees without approval from the employee or a judge, said Corey Stoughton, the ACLU lawyer on the case. When executives at Dixie Specialty Insurance, a Mississippi company, noticed a few employees were working more slowly than they once had, they installed software from Awareness Technology on company computers to monitor what websites the employees were visiting and block the more popular ones. Productivity jumped, said Cassandra Phillips, the company’s information technology manager. Software from another company, SpectorSoft Corp., tracks how much time employees spend on certain websites and can measure whether it is “active time” — whether or not the employee is typing or clicking, for example. In the private sector, the objective of surveillance is enhanced productivity. And it works best, in true Panopticon style, when employees assume surveillance is universal and pervasive and modify their activity without the local Bill Lumbergh showing up to give them a nudge. And then the company can lay off Bill Lumbergh! That’d be great! Start chewing those Rolaids, Bill! In other words, control is internalized together with, of course, the stress. In private life, I think a similar dynamic will apply as surveillance becomes more pervasive. The result will not be enhanced productivity; it will be enhanced compliance. We will experience the Stasi-worthy anxiety that our activities are being continually observed and judged and we may be found wanting. That’s life in the brave new world of the Panopticon. "The program facilitates extensive, in-depth surveillance on live communications and stored information." Additionally, one "chart prepared by the NSA, contained within the top-secret document obtained by the Guardian, underscores the breadth of the data it is able to obtain: email, video and voice chat, videos, photos, voice-over-IP (Skype, for example) chats, file transfers, social networking details, and more." "For the balance of the evening and for some time to come I thought about all the systems to which this circuit had complete and possibly unfettered access. The circuit was tied to the organization's core network. It had access to the billing system, text messaging, fraud detection, web site, and pretty much all the systems in the data center without apparent restrictions." "In 2003 AT&T built 'secret rooms' hidden deep in the bowels of its central offices in various cities, housing computer gear for a government spy operation which taps into the company's popular WorldNet service and the entire internet. These installations enable the government to look at every individual message on the internet and analyze exactly what people are doing. Documents showing the hardwire installation in San Francisco suggest that there are similar locations being installed in numerous other cities." "Metadata provides enough context to know some of the most intimate details of your lives. And the government has given no assurances that this data will never be correlated with other easily obtained data. They may start out with just a phone number, but a reverse telephone directory is not hard to find. Given the public positions the government has taken on location information, it would be no surprise if they include location information demands in Section 215 orders for metadata." "The Lab" is a new groundbreaking Israeli documentary film that redefines our entire understanding of the Jewish State, its aims, its identity and its global destructive role. I honestly believe that this film is the deepest and most important commentary on Israel. 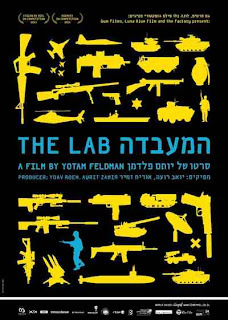 In ‘The Lab’, Director Yotam Feldman exposes the Israeli military industry and its operation, he interviews some major protagonists within Israel’s ‘security’ trade. He elaborates on the role of the industry within the Israeli society and economy - in the last few years Israeli security exports reached an unprecedented level of $7 billion a year. A full 20% of Israeli exports are military or military related. Approximately 150.000 families in Israel are dependent on that industry. Israel is now the fourth biggest military exporter. In the last decade, every Israeli military operation led to an immediate sharp increase in sales of Israeli military export around the world: weaponry, systems, intelligence, strategies, doctrines, knowledge and experience. Feldman provides us with a glimpse into a very organized universe. We visit Israeli weapon fairs around the world but we also see arenas filled to capacity with foreign generals, public officials and diplomats. They are all shopping for Israeli military products. The message is clear, the 7 billion dollars is just part of the story. Israeli military elite is now deeply interwoven with the political and military elite of every country around the globe. This emerging Israeli business buys the Jewish state influence and support. Foreign Generals – A Segment from The Lab from Gilad Atzmon on Vimeo. 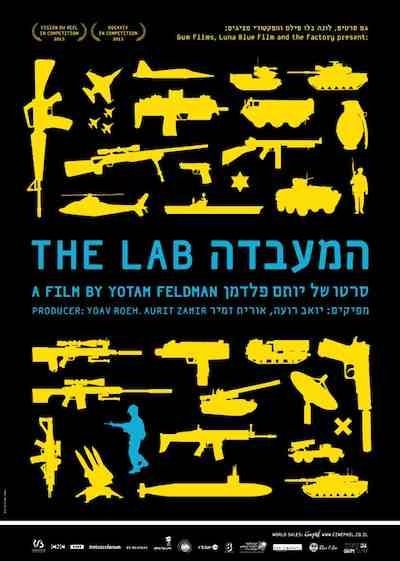 "The Lab" makes it evidently clear that the Palestinian civilian population in the West Bank and Gaza have become test subjects for Israeli tactics, weaponry and fighting philosophy (‘Fighting Torah’, Torat Lechima - as the Israelis call it). The destruction of the Palestinians has now been transformed into a very profitable industry. We are dealing here with nothing short of highly calculated murder. Through a set of fascinating interviews, Feldman conveys a very genuine picture of the Israeli death merchants. Feldman lets them talk, he hardly interferes. They are sharp, they are genuine, they are even funny at times, occasionally witty, and a few of them, might even be charming if you did not know who they are. But make no mistake, they are sinister, some of them are clearly psychotic, they are mass murderers and they are free. They sell destruction and havoc and do it very successfully. Being myself an Israeli-born and raised successful musician and writer, I think I can recognize Israeli dedication, perseverance and creativity when I see it, no matter into what service it is pressed. (Perhaps I was lucky to be rescued by bebop.) Those Israeli death angels’ talent is driven into the amplification of human misery. The consequences are tragic. It is far from being a secret that a century of Palestinian struggle led to practically nothing. The state of the Palestinian solidarity movement is even more embarrassing. Feldman's "The Lab" is a game changer, for it can explain decades of impotence. We are immersed in flawed terminology - ‘colonialism’, ‘apartheid’, ‘conflict’, ‘solution’, ‘Zionism’ are just few examples. Gaza is now a vast Laboratory - the Israelis are the ‘scientists’ and the ‘technicians’, the Palestinians are the ‘guinea pigs’. Watching "The Lab" must lead all of us to fundamentally question our notions. We are dealing with a premeditated war crime. The notion of resolution (as in ‘two-state solution’), for instance, is not applicable. It is clear beyond doubt that in the real world the ‘scientist’ does not negotiate with the ‘guinea pig’. The ‘scientist’ also doesn’t consider sharing reality with his ‘guinea pig’ in a ‘one democratic state.’ "The Lab" is a glimpse into the Israeli mind: you clearly do not find much compassion there. For decades we were foolish to examine the success and failure of Israeli military operations in reference to Israeli military and political ‘objectives,’ as we surmised them. We were clearly wrong. As we learn from Feldman’s film, the real objective of Israeli operations may as well be examining new doctrines and operational systems in order to distribute them around the world soon after. Ehud Barak, for instance, wasn’t exactly the most sophisticated Israeli minister of defense, he clearly failed to defend his people or even make them feel secure. However, he was very successful in selling Israeli weapons and doctrines. Tel Aviv being subject to a barrage of Qassam rockets may be seen by Israelis as devastating news, but from a military industrial point of view, it was a golden opportunity to examine and promote the Israeli anti-missile system Iron Dome. If I am correct here, it becomes clear that like the Palestinians, more and more Israelis are also becoming ‘guinea pigs’ in this ever growing military laboratory. One may wonder how and when "the Zionist dream" transformed itself into a military business. Only a few of us, writers and scholars, have attempted to answer this question. The transformation of the Jewish State into an oppression factory is apparently a direct outcome of Israel’s supremacist ideology. If we want to understand what is happening in the Jewish State, we must first grasp the notions of choseness, Jewishness and Jewish identity politics. I guess that enough Palestinians in Gaza do realise by now that they have been part of an Israeli experiment. Every too often we learn from Palestinian doctors that while treating casualties of Israeli aggression they encounter new types of wounds. The Lab explains it but it isn’t Palestine alone. We also witness a growing similarity between the operational mode of police forces around the world and the IDF treatment of the Palestinians. Watching Yotam Feldman’s "The Lab" explains it all. We are all Palestinians. We are either occupied by Israel or by its proxy forces around the world - those who are trained in Israel and implement Israeli weaponry and tactics. Gilad Atzmon was born in Israel in 1963 and had his musical training at the Rubin Academy of Music, Jerusalem (Composition and Jazz). As a multi-instrumentalist he plays saxophones, clarinet and ethnic woodwind instruments. His album Exile was the BBC jazz album of the year in 2003. He has been described by John Lewis on the Guardian as the “hardest-gigging man in British jazz". Atzmon is touring extensively around the world playing in festivals, concert halls and clubs. 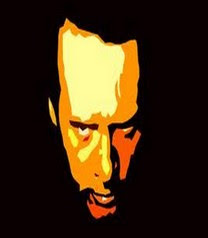 His albums, of which he has recorded twelve to date, often explore political themes and the music of the Middle East. Information Clearing House - The recent NSA leaks from whistleblower Ed Snowden have publicly confirmed that digital privacy does not exist. The federal government and intelligence agencies have direct server access to the world’s most popular sites and services including Facebook, Google, Microsoft, Apple, and more. This means that all of your data when using these services including Skype, YouTube, etc has been compromised and can be used against you whenever strategically necessary. Elizabeth May: Mr. Speaker, I rise, I suppose I should say this morning. It is still June 11 on the calendar in front of the Speaker, but we know that it is June 12, at 12:16 a.m. I am pursuing a question that I initially asked in question period on March 21. The question relates to the Canada-China investment treaty and its quite extraordinary measures which stand in quite sharp contrast, not only to other treaties in which Canada has become involved, but other investment treaties as well. On March 21, I contrasted some of the provisions of the treaty that had been tabled in the House in February with the small African nation of Benin. For this treaty, we have very low levels of trade compared to the $7 billion with the People’s Republic of China. I want to highlight one of the aspects of the Benin treaty versus the Canada-China investment treaty tonight. It is very difficult to get a proper debate on this issue. As you know, Mr. Speaker, we have not have had a proper debate on the Canada-China investment treaty, although it stands poised for ratification by the cabinet alone. I should pause to thank the Hupacasath First Nation, near Port Alberni on Vancouver Island, for having the courage to take the matter to court. For three days of the last week, they were in court in Vancouver. We all await the decision of the judge in that matter, adjudicating as to whether first nations’ rights have been violated. No first nations across Canada, whether treaty nations or otherwise, were consulted before the treaty was signed between the current Prime Minister and President Hu of China. The specific matter I want to concentrate on in the remaining two and a half minutes that I have is the question of exit provisions. The first investment treaty in which Canada became involved was NAFTA, chapter 11, which allows exit by Canada, the U.S. or Mexico on 6 months’ notice. The provisions of the treaty with Benin, to which I referred on March 21, are certainly much longer than that. There is a one-year notice period, and after one year’s notice, any existing investments between Canada and Benin are protected for a further 15 years under the terms of the treaty which Canada and Benin at that point would have exited. The extraordinary thing about the treaty with the People’s Republic of China is that there is not six months as under NAFTA, or 16 years as under the treaty with Benin, which is bad enough; under the treaty with the People’s Republic of China, Canada is bound for the first 15 years before notice can be given, followed by one year’s written notice and then a further 15 years in which any investments made by the People’s Republic of China are protected. In other words, once ratified, this treaty will bind any Canadian government in the future for 31 years from the point at which the treaty is ratified. It is quite extraordinary. I want to comment on a common misconception. Because the current Prime Minister has seen fit to withdraw Canada from a number of treaties, namely the Kyoto protocol and the convention on drought desertification, it has created some sense in the land that a future prime minister can just rip up a treaty. Let us be clear. The current Prime Minister executed withdrawal from Kyoto under the terms of the Kyoto protocol. One year’s written notice was required. Canada exited the treaty on drought desertification on the terms of that convention. A notice of 90 days was required. The Canada-China investment treaty would bind any future prime minister and government for 31 years. There is no way out, and if Canada were to unilaterally leave the treaty, it would be subject to damages and damage claims in 100 countries around the world. In other words, the only way to stop this convention is to prevent ratification. 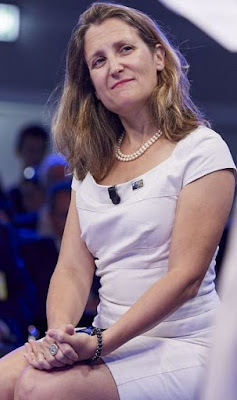 Shelly Glover: Mr. Speaker, although I have tremendous respect for that member of Parliament and know she works hard and whatnot, I am quite surprised at the lack of knowledge the member has on some of the information regarding this exact treaty. Let me take a moment to refresh my colleague’s memory about why Canada is involved in this specific treaty. Our government understands the importance of trade to our economy. It represents one out of every five jobs in Canada and accounts for 62% of our country’s GDP. That is why our government moves forward with ambitious pro-trade plans. They are really the most vigorous in our country’s history. Our plan is to open new markets for Canadian exporters. That includes in the fastest-growing Asia-Pacific region. The opportunities for Canadian exporters in the Asia-Pacific are absolutely phenomenal. Countries in the region include those with economic growth rates of two to three times the global average. However, before I speak further about the opportunities for Canada in the Asia-Pacific, and particularly with Canada’s second-largest export destination, China, I would like to comment on a reference the member opposite made in her original question to our FIPA with Benin. The FIPA with Benin is just one example of our government’s engagement in Africa. In fact, in addition to Benin, Canada has concluded FIPA negotiations with Cameroon, Zambia, Madagascar, Mali, Senegal and Tanzania. These investment treaties will strengthen economic ties between Canada and these partner countries and help Canadian companies invest with greater confidence in these markets. At the same time, facilitating two-way investment helps generate jobs, growth and long-term prosperity that we all hope for in Canada. Our government is proud of the steps we have taken to strengthen ties with our partners in Africa, but we help Canadian exporters and investors capture new opportunities in other fast growing markets around the world, including in Asia. An important part of our commercial relationship is ensuring that not only two-way trade occurs, but also investment between Canada and other countries can take place in a stable and secure manner. That is why Canada has over 24 foreign investment promotion and protection agreements with key trade and investment partners, including with China, the world’s second largest economy and now Canada’s second largest export destination. This is only second to the United States of America. Canada’s trade relationship with China continues to grow. In fact, Canadian goods exports to China rose 15% last year, to over $19 billion. Not only that, but Canada’s exports to China have nearly doubled under our Conservative government. This is a favourable agreement that lends to create the opportunities that Canadian exporters need. It also provides opportunities in China, so Canadians can be present on the ground. That will lead to growth, economic prosperity and job creation. Along with this trade agreement, there are many other good things to come. I sincerely hope the member opposite will give a second look to the agreement, because there are some wonderful opportunities for Canadians. I hope she will side with us in allowing us to provide those opportunities as have been indicated. When asked if Israel would “annex” the West Bank, Dannon said that Israel will not do so, but will continue its settlements activities “on vacant lands in the West Bank”, and will act on to turning the Palestinian areas into “settlements”. Protesters are met with new wave of police brutality, as thousands of lawyers join demonstrations. Don Staniford et al ended up debating with a Co. manager when they went to send a message to Norwegian Fish-farming companies that they do not want them operating in Clayoquot Sound's pristine waters. I want to clarify my position on the proposed Site C Dam: I AM AGAINST IT. One of the troubles in this business is that one comments on many aspects of the environment and can have a word or two or a line taken out of context - as happened with a column of mine last week, in which I referred to newly elected Premier Clark's resolve to push forward with the dam to power shale gas operations. Here are my thoughts on Site C.
We do not need the power, nor will we in the foreseeable future. In a blog sometime many years back, I answered the question, “Isn’t Site C better than so-called 'run-of-river' projects?" My answer was if that’s the choice we face, I suppose I would have to agree. Except it’s a false premise, since we don’t need either. That was, I believe, about 2008. Now I would leave no doubt. These are two separate issues. I am unalterably opposed to so-called “run-of-river” because they not only destroy our precious rivers, they are - if they haven’t already - bankrupting BC Hydro. Let’s then look at Site C. They say this will cost $8 billion – using the usual margin of error on such matters, we can safely assume it will be at least 25% higher, say $10 billion. At any price the project would wipe out a large and very important amount of farmland and wildlife habitat. Premier Clark has already designated the power for Liquefied Natural Gas (LNG) - which is enormously energy intensive - and it is here we descend into the world of madness. Premier Clark says that LNG will eliminate our debt of $57 Billion. Well, for starters, the real number is $171 Billion, or $40,000 per man, woman and child! This will also give us a “Prosperity Fund” of over $100 Billion. At this point we have no firm customers for one cubic meter of LNG and none on the horizon! Of course companies will say they are going to recover all this natural gas, ship it to Prince Rupert and sell it to China and Japan. I repeat – there isn’t a single firm contract in place and my bet is there never will be. We’re in an entirely new world from a few years ago. A process called “fracking” lets one drill vertically into shale rock up to a kilometre or more then horizontally to capture fossil fuels trapped between the layers of shale. They do this with huge quantities of water laced with chemicals. Leaving aside, for the moment, the question of markets and refineries, I’m sure you’ve picked up a couple of important environmental questions. What does this process do to the fragility of the nearby landscape? And, what about the water? It takes huge amounts – where does it come from and where, after it’s become so toxic, does it go? The fracking and LNG processes use large quantities of power – this is where Site C comes in. We would sacrifice all that land in order to make power to be sold at bargain rates to gas companies. We, the people of BC, would make power, sell it at a discount to a company that would use that power to make more energy, to which more energy would be applied so as to transfer it to an LNG plant in Prince Rupert, where energy would be used again to make more energy to be shipped and sold! Now let’s look at the markets. "The difference between U.S. and Asian gas is poised to drop by more than 60 percent by 2020, leaving exporters facing a loss of as much as $6 million per tanker, according to calculations by Bloomberg based on data from Rice University in Houston." Moreover, if Asia does need gas, Australia is already in the position to supply it. In fact, the immense amounts of public money spent on this is a huge scandal in Australia which, it seems, Premier Clark wants us to join. Let there be no doubt – I and my colleagues at the Common Sense Canadian stand firmly against Site C, no matter what those who would ravage our environment, much including the governments, would have us believe. To Site C, the answer is NO.